At work, I have been doing a bit of work around investigating and developing a learning hub. I also attended the 5th National Coaching in Education Conference, exploring the coaching approach. On the home front, our youngest daughter is growing up way too fast (and way to cheeky). She has progressed from climbing stairs to climbing anything and everything to get what she wants. Personally, I signed up for the Ed Tech Coaches Blogging Buddies program, where you join a group of five others in committing to both post and comment regularly. I am interested to see how it goes. Exploring Facebook Pages – A guide to Facebook Pages, including critical questions and considerations. Predicting Google Drawings 2.0 – I have been saying to quite a few people that there seems to be change afoot in regards to Google Drawings. This got me thinking about what I would actually want in a revised version. 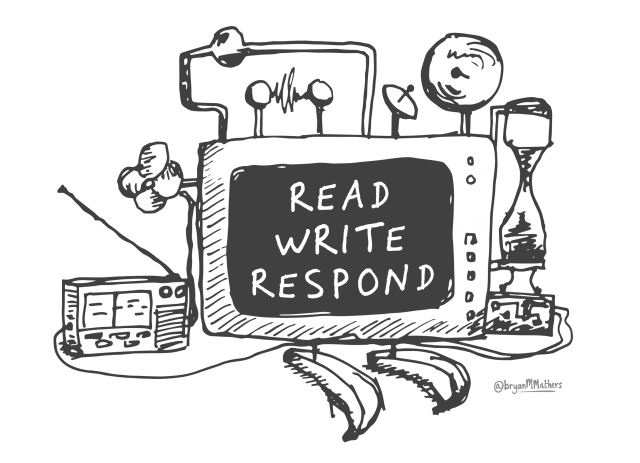 My #EdTechRations – A cross between a review and a response to David Hopkins’ curated book on the technology you would not leave home without. Picking a Portfolio Platform – A summary of some potential platforms for student portfolios. Engaging with Algorithms – A look at the Explore tool and the way that it makes use of Google’s APIs. I wrote this before the I/O conference and that only confirmed many of my hunches. Making an Online Learning Hub – An investigation into the way that a number of organisations structure their learning hubs and the tools they use. 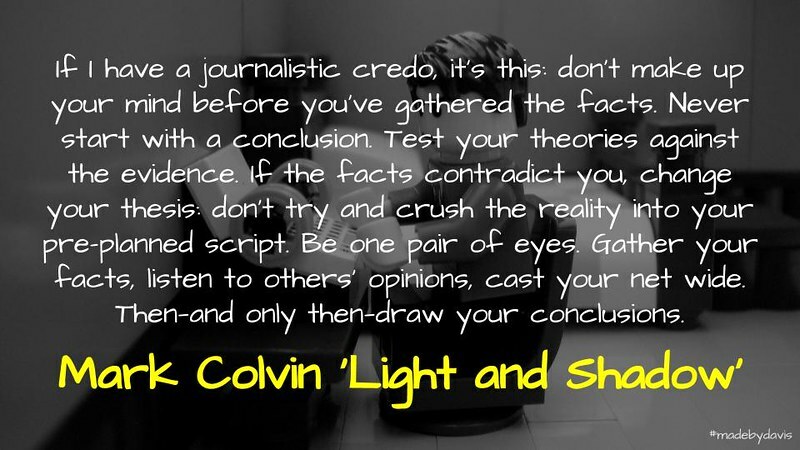 Light and Shadow by Mark Colvin – a review of the late Mark Colvin’s memoir of life in journalism and as the son of a spy. My Awesome Reading List – A documentation of the way in which I used Awesome Tables to create a more dynamic organisation of my reviews for my blog. Taking Tech Beyond the Tool – A post unpacking Doug Belshaw’s essential elements of digital literacies as a framework for working through some of these idiosyncrasies of technology. Creating Video Content – A review of some applications to use to create video content, with examples to support. NOTE: An anonymous comment pointed out a glaring mistake in one of my posts this month. In my discussion of the new Google Sites, I wrongly stated that Google had bought out Wix. I laugh and cringe in reading this now. I swear I read something last year, but can find no evidence whatsoever. It also illustrates that fake news is not always devious, sometimes it is a mistake. This free course can teach you music programming basics in less than an hour – Quincy Larson discusses Ableton’s free interactive music course that runs right in your browser. Having taught music a few years ago, I found this as a much more engaging method of grappling with the different principles of music in an interactive way. If you enjoy listening to music, but don’t know much about how it all works on a structural level, this course is for you. It will teach you some of the principles at work in popular songs like Queen’s “We Will Rock You” and Björk’s “Army of Me”. The Cartography of Learning – Jose Picardo uses feedback to unpack research into feedback, such as providing regular dollops and developing a roadmap. This is something that I have reflected upon before elsewhere, while it is also interesting reading alongside Deborah Netolicky’s post about the benefits of formative assessment. This article is an attempt to explore what makes feedback effective and therefore where schools should focus their policies, which should encourage teachers to view giving feedback as an integral part of teaching, not as an additional intervention. Make Your Own Word Search in Google Sheets – Alice Keeler has created a script for generating a word search using Google Sheets. What interests me most about this is not the creation of the task, but the steps involved. From a Digital Technologies perspective, this is a great example of abstraction, breaking a problem down to its parts, and then thinking algorithmically in the creation of a solution. Interpreting, and Honoring, the Words of Others – Kevin Hodgson looks at Lumen5, a webapp which allows users to turn blog posts into videos. Integrating with free to use images and audio, it provides a creative way to demonstrate close reading. Search for Syria – UNHCR has created a site in partnership with Google unpacking different elements of the Syrian war. A useful resource for looking into the crisis. What should teachers understand about the snapchat back-channel? 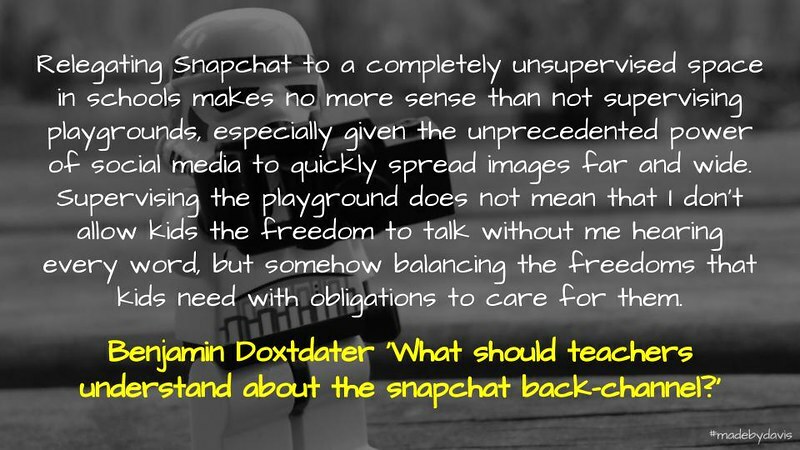 – Benjamin Doxtdater questions the place of Snapchat and other such backchannels in the classroom. Sachin Maharaj goes a step further to calling for it to be actively banned. For Steve Brophy, this is about waterholes. This takes me back to the question about what sort of teacher you are: limiters, enablers and mentors. However, as Bill Fitzgerald’s investigation into Edmodo demonstrates, there is also an ethical side to be considered. This was also highlighted by Twitter’s changes to privacy. Relegating Snapchat to a completely unsupervised space in schools makes no more sense than not supervising playgrounds, especially given the unprecedented power of social media to quickly spread images far and wide. Supervising the playground does not mean that I don’t allow kids the freedom to talk without me hearing every word, but somehow balancing the freedoms that kids need with obligations to care for them. 11 podcast episodes about the Internet – MJ Kelly from Mozilla curated a list of podcasts to dig deeper into the internet. These episodes touch on questions of privacy, investigations of ownership, developing an open web, trolling, password management, algorithms and archiving the net. Along with BTN’s guide to the internet and Kin Lane’s reflections on personal data, these resources provide a useful start for appreciating the complexities of the web. Let’s Not Start from Scratch: Some Early Research on ‘Coding’ – There is so much written about coding, whether it be CSFirst or various applications to use for students. Although these represent fine endeavours, Peter Skillen encourages people to go back to the beginning, the time before scratch, and review the lessons learned then, rather than make the same mistakes again. To support this he has summarised a number a findings and links to their elaborations. Along with the Daily Papert project, these texts offer a provocation for going further. How Google Took Over the Classroom – Natasha Singer traces a history of GSuite and Google’s rise in regards to the classroom. She tells the tail of Jaime Casap and his ability to sell Google to schools. There is a lot of conjecture about why Google do what they do. Users? Advertising? Licences? Algorithms? My question is what is the alternative? Microsoft? Would that be any different? Seems that they are all in a race to master artificial intelligence, changing what is means to ‘Google it’. Audrey Watters wonders if this is the ‘new normal’ and questions the consequences, while Ben Williamson describes it as platform capitalism. Google makes $30 per device by selling management services for the millions of Chromebooks that ship to schools. But by habituating students to its offerings at a young age, Google obtains something much more valuable. 55+ Most Wanted WordPress Tips, Tricks, and Hacks – The team at WordPress Beginner compile a list of advice associated with WordPress(.org). Along with the guide to getting going, there is something for every user, even if it is a deeper appreciation for the way that WordPress works. It is also a reminder of Kin Lane and Audrey Watters’ concern that WordPress involves too much and that the future of domains and so forth may be in applications, such as Jekyll. Ever wondered what WordPress tips, tricks, and hacks most popular WordPress sites are using? In this article, we will share some of the most wanted WordPress tips, tricks, and hacks that will help you use WordPress like a pro. Classdojo App Takes Mindfulness To Scale In Public Education – Ben Williamson continues his exploration of Class Dojo. This time he focuses on the effort to bring mindfulness into schools. The concern that he raises is whether teaching students to be resilient is the answer or whether we really need to address the deeper problem of the standardised, dataification of education. This is something that Graham Martin-Brown also touches on in a new project. It is probably a step too far to suggest that ClassDojo may be the ideal educational technology for digital capitalism. However, it is clear that ClassDojo is acting as a psycho-policy platform and a channel for mindfulness and growth mindsets practices that is aimed at pathology-proofing children against anxious times through the imposition of positive feelings in the classroom. While taming ‘the Beast’ of his uncontrollable emotions of ‘anger, fear and anxiety’ through mindfulness meditation, ClassDojo’s Mojo mascot is both learning the lessons of positive psychology and acting as a relay of those lessons into the lives of millions of schoolchildren. Its model of pocket-based psycho-policy bypasses the kind of slow-paced bureaucracy so loathed in the fast-paced accelerationist culture of Silicon Valley, and imposes its preferred psychological techniques directly on the classroom at global scale. No Me Without Us: Reflections After the UNIR #SelfOER #OpenTuesday Webinar – Reflecting on a recent call in regards to OER, Maha Bali discusses some of the challenges associated with the privilege around sharing. This is a continuation of a discussion around OER as a way of being. I think about sustainability of openness if no model is in place to ensure it is financially sustainable, and I also think that for some of us, dissent and being on the cutting edge might also be a need, such that we will always be working on something in some way unorthodox and unfunded. And for some of us the need to share is a drive, difficult to stop. In the same way that we need to understand that for others, there is a need to NOT share, be it a personality thing or because they risk real harm or have experienced real harm from sharing in the past. But also to ask someone NOT to share when sharing is a way of being for them? It’s really hard. The Over Promotion of Failure – Jackie Gerstein reflects on the focus on failure and wonders if it was all something that did not quite go to plan. Rather than celebrating what did not work, she has developed a set of questions to identify the successes and what could be done next time to improve. This reminds me of the strength-based approach, where the focus is on highlighting strengths in order to build confidence to go further. I reframe the idea of failure, that oftentimes occur within open-ended, ill-defined projects, as things didn’t go as originally planned. It is just a part of the learning process. I explain to my learners that they will experience setbacks, mistakes, struggles. It is just a natural part of real world learning. Struggles, setbacks, and mistakes are not discussed as failure but as parts of a process that need improving. The focus becomes on what went right and on how learners can increase those aspects that were successful. The underlying learning principle becomes success breeds more success. This Week In Webo-plasmosis – Using the example of a parasite shared between mice and cats, Michael Caulfield wonders if we have a webo-plasmosis that encourages us to mindlessly share personal details online that can then be mined by advertisers. He provides a partial list for users to identify if they have the parasite. Caulfield’s weekly newsletter is a good read for such topics. Do you retweet headlines you agree with to help Facebook build a profile of you, while not reading the articles? Do you take pictures of your food, helpfully labelling your dietary habits, consumption patterns, and common meal ingredients? Have you become an email hoarder, never bulk deleting old email on fear “you might need it someday”, thereby preserving the vast library of documents Google needs to model your affinities, desires, and personal secrets? When something happens to you of note, do you feel compelled to log it on the web? Do you join Facebook groups that best express who you are? Do you use Amazon Alexa’s much touted “Shopping List” feature to build a list of things you intend to buy locally, so that Amazon now has a list of things you buy locally? Do you wince at the thought of taking old tweets offline, because of all the “old memories” stored in tweets you haven’t looked at for five years? Do you authenticate into third-party services using Twitter, Facebook, and Google identity so that they can better track your online behavior? Do you never use aliases or pseudonyms online, and are you convinced that this “transparency” somehow makes you a “more honest person”? Do you find yourself posting lists of bands you’ve seen, or asking friends to share “one memory they have about you”? 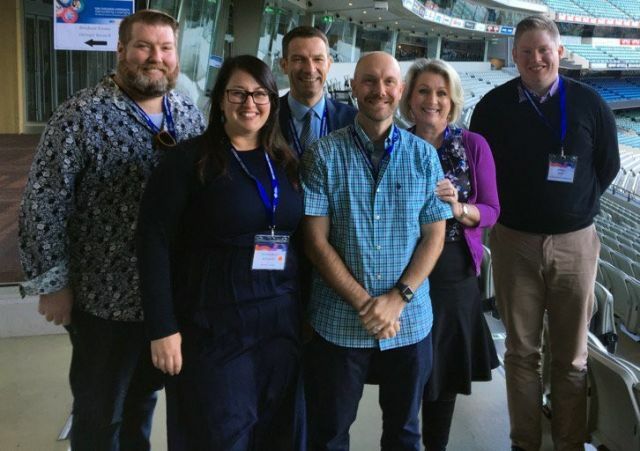 Update: Opportunity Knocks Again, And Again, And Again – Jon Andrews provides an update of his analysis of Visible Learning. Bringing together the critiques from Snook et al, Simpson, Jones, Orange and Eacott, Andrews questions whether we can continue to ignore the issues anymore. This leaves me wondering about the alternatives? Is it returning to ideas around a ‘good education’? Is it about driving change from the ground on up? Responding to the criticism of Stephen Dinham, Adrian Camm suggests that pedagogical practice is about choosing the right strategy for the situation. The seductive rhetoric of Hattie’s work can be found almost everywhere and certainly seems compelling. With questions being asked of the methodological credibility upon which all else gushes forth, shouldn’t we be questioning how much we buy into it? Surely we cannot ignore the noise, not necessarily because of its message, but because the noise is becoming a cacophony. Building Staff Culture: The Importance of Trust – Chris Wejr looks back on his experiences as a principal and discusses some of the strategies that he has used to foster a culture of trust. Along with Paul Browning’s book, Eric Sheninger’s post and Ray McLean’s work with Leading Teams, Wejr’s post is a reminder of the importance of trust to education. In order to create positive change in schools, there must be trust – not only between staff members but also between staff and the principal. In my first position as a principal, I moved from being a vice-principal to a principal at the same school so people already knew me and had a better idea of what I stood for as an educator. There was a level of trust already there but this was not the case when I moved to a new school. When I arrived at my current school 3 years ago, I assumed that trust would be easy to build between the staff and me. I felt I was a decent guy with experience as a principal and there was no reason NOT to trust me… so building trust should happen rather quickly. I had plans to work on trust with me (as well as between staff) but I had no idea it would take as long as it did. I have learned a ton in my 3+ years at James Hill, especially in the area of building trust. It is not something to be rushed and it takes a lot of effort and time to ensure that trusting relationships are solidified. 5 Ways Students Should Be Connected Beyond Technology – Peter DeWitt discusses connections and reminds us that it is more than just technology. He talks about connections to ourselves, peers, families, nature and society, I think that this is important and something that I touched upon in my discussion of PLNs. Our Smartphones provide us with a very important connection to our outside world. Many of us remember a time before the internet and social media. However, our students do not because they have grown up with it around them. As important as being connected and learning how to use Smartphones appropriately is important, so is putting them down and finding connections in other ways. Transforming Tension And Disequilibrium Into Breakthrough Experiences – David Culberhouse discusses the challenges associated with the tensions of change. One of the biggest tensions being the maintenance of everyday practice, something that Dean Shareski touches on in a recent post. Eric Ries talks about sandboxing elements of change from the status quo, while John Kotter describes it as the dual operating system. This also reminds me of Raymond Williams’ discussion of Dominant, Residual And Emergent. It is only through individual and organizational capacity that transformational breakthroughs are achieved, and we actually achieve the epiphany of change. It is in our capacity-building efforts that the tension and disequilibrium wrought on by change is able to be redefined and repurposed for growth and autonomy, rather than politics, power struggles and dysfunctional structures and processes. It is only in this shift, that change can emerge as a more productive and transformational process for our individuals and organizations. Out of the Darkness – Tom Sherrington reflects on the emotional challenges of failing an inspection. This reminds me of the suicides of Mark Thompson and Carol Woodward, both based on the pressures of leadership. Paul Browning suggests that if a headteacher does not look after themselves first and fore-mostly, they are useless to everyone. In an environment of increased accountability, how leaders are supported is so important. If work makes you cry – that is stress! You need to get help…. I didn’t recognise it, so I didn’t. After battling 20 years with a rare disease while covering a crisis in Rwanda in 1995, distinguished journalist Mark Colvin passed away this month. Along with Tony Delroy, Colvin’s voice on the ABC is one of those things that I came to assume. Inspired by Austin Kleon who suggests reading reading obituaries to learn from those who have come before, here are a collection of thoughts and reflections to leave you inspired. Mark Colvin, the man who watched the world for Australia – An obituary from the ABC which mixes images and text celebrating Colvin’s life. ‘The nation has lost our greatest broadcaster’: Mark Colvin, an inspiration to Tony Jones – A reflection on PM from colleague, Tony Jones. Anything But with Mark Colvin – Julia Baird discusses beauty, resilience, happiness and stoicism with Colvin. 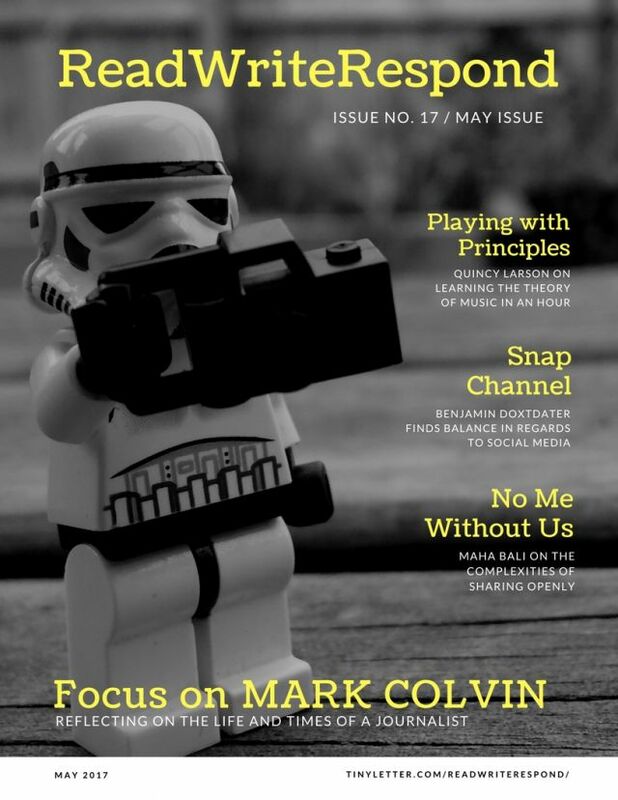 Mark Colvin had the ability to reach through the microphone into our minds – Jonathon Holmes shares his own connections with Colvin. Mark Colvin, of Australia and the World – James Fallow remembers Colvin and the times in which their lives crossed over time. Vale Mark Colvin: eternal optimist and journalistic force of nature – Jim Middleton documents Colvin’s life in journalism from Double J to Four Corners to Foreign Correspondent to PM. PM presenter Mark Colvin takes time to answer your questions on Reddit – Colvin provided an insight into his thinking through a session where he answered questions from Reddit users.